LAURA Plummer, local folk singer and leader of the Lecale Singers has just returned from a break in Seville in Spain and Granada. She said: “After that winter it was really great to dry out. These cities had been on my list of places to see before I give up on airports for good and so glad I got the opportunity to go. “The Singers’ Circle at Down Arts Centre has got into full swing for term three and we have six new members which is brilliant. It’s all songs of the sea this term. “The Downe U3A Singers Thursday afternoon singing class continues to meet in the Ballymote Centre and new members are very welcome. You can visit Downe U3A website or contact me for further info. Folksinger Laura Plummer with the Lecale Singers during s St Patrick’s Day session the St Patrick Centre with the Voices of Lecale. “The Voices of Lecale have made a tremendous fundraising effort. 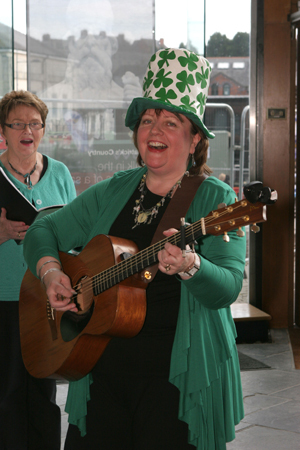 The choir drawn from members of the Singers’ Circle had our annual Sponsored Sing on 27 April in the St Patrick Centre. Both the singing and the fundraising have gone really well. We are on our way to making our third CD next month in aid of PIPS. We’d like to give a big thank-you to the staff and customers of Minerstown Tavern who donated around £100 to this project and to our hardworking and committed members many of whom have already collected over £100 each in sponsorship, and with Smartie-tube collections etc. ” The ‘Voices of Lecale” sang at our first wedding in Ballee Parish on 20 April when Holly and Richard tied the knot. The sun came out, everyone was happy and the singing went down very well. We sang ‘To make you feel my love’ (Dylan), ‘Walk the road together’ (Kate Rusby), ‘Put a little love in your heart’, and two spirituals – ‘Down in the river to pray’ and ‘This little light of mine’. We wish them both every happiness. “And it is Anchors Aweigh! 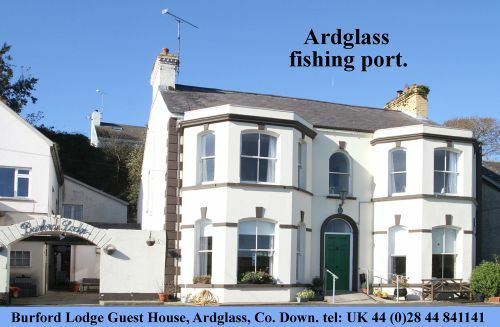 at our next performance on Sunday 2 June for the Strangford Maritime Festival. Last year we were in Portaferry and this year we’re on the other side of the Lough in Strangford at The Cuan starting at 2pm. If you’re free and in the area why not dust off your deck shoes and come join us for the craic? “The practice videos on YouTube for the ‘Voyages’ project have been getting a lot of hits so from now on I will probably upload new songs and voice parts as a teaching and learning aid. You just get out your song-sheets, switch on your computer and click on the links (on my website). The harmony parts are up there so if you spend a wee bit of time at least twice a week between classes practising you’ll feel a lot more confident learning and performing the songs! Like anything else in life, the more you put into it the more you’ll get out .